With fewer daylight hours and longer cold nights, natural food sources needed for energy to keep warm are scarce. Water supplies can be frozen or snow covered. When the challenge of finding natural shelter increases, wild birds will oftentimes turn to man made habitats to provide refuge from winter winds, rain, snow and ice. • Providing Food: During the winter months, provide high calorie and high fat foods. Offer oil sunflower seed in the winter. It has twice the calories per pound than striped sunflower and its thin shells make less mess when discarded by the birds. Suet is a great food for them as well. It contains a wholesome fat substance that is helpful in winter months when natural sources like insects are harder to find. The extra calories keep their bodies warm. Offering peanuts is a good source of needed protein. Be sure to position feeders out of the winter winds. The ideal placement would be the east or southeast sides of a house or near a hedge row of evergreen trees. • Providing Water: You can provide a year round water source by heating the supply of water to prevent it from freezing during the winter months. • Providing Shelter: Natural plants and trees act as shelter for wild birds, as well as offering them protection from predators. 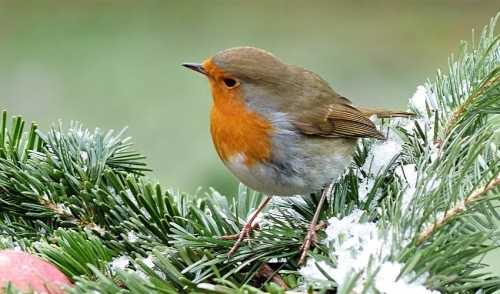 As a bird enthusiast, keeping a fresh supply of food, water and providing shelter will enable your feathered friends to sustain themselves over the winter months.